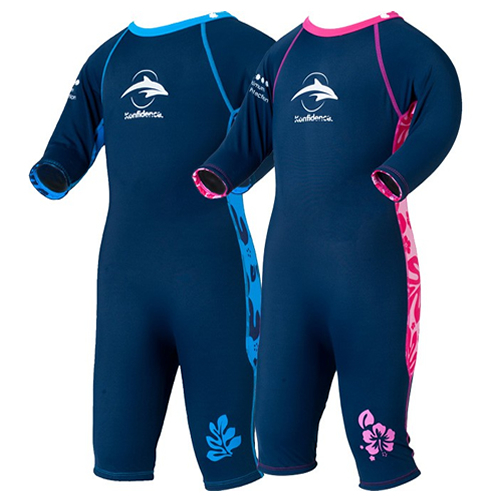 These new, cool surf-looking, long sleeve baby and kids Konfidence Sun Protection Suits are the ideal beach or back garden sun block, with the need for sunscreen greatly reduced. Made from a close knit Nylon Lycra material the suits are super soft and stretchy to give maximum protection and superb comfort. The suits feature the latest UV colour changing technology. A Photocromatic UV indicator in the form of the Konfidence logo on the front of the suit cleverly changes colour to tell you when UV rays are present. So, you'll instantly know when the suit is working its protective magic. Ultra comfortable and quick drying, these sun suits have full length sleeves and 3/4 length legs ensuring your child receives maximum protection from the sun and allows for more time spent playing outside without the worry of sun damage. The less exposed skin means less hassle for you too, as there's better chance of applying that sunscreen before your little angels start to fidget. 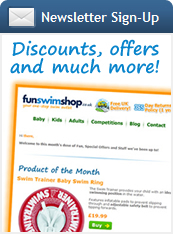 Rigorusly tested for colour fastness and durability the Konfidence Sun Protection Suits are superb for younger children as the material moves and stretches with them. Plus, the close knit body-huggable material means nappies stay put and sand is kept out too. These sunsuits also incorporate crotch poppers on the 6-12 months and 1-2 years sizes to make nappy changing less of a hassle and more of a doddle.